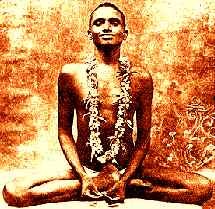 Nityananda was born just before the beginning of the twentieth century (about 1896) and lived until 1961. He was a Sat Purush, or Antarjnani, an enlightened being who was always in the Atmic state, even as a child. He was found as an infant in a jungle in India by a woman collecting firewood who was attracted to a heavily wooded area by the loud cawing of crows. She had her own family, so she took up the infant and gave him to her friend who had a barren daughter. The daughter was a servant in the home of a high caste Brahman lawyer, Ishwar Iyer. She named the baby Ram (a synonym for God). As an infant, Nityananda was troubled by a serious ailment and was miraculously cured in a very strange manner. His adopted mother took the sick child for a walk and soon saw a dark skinned foreigner carrying a large bag slung over his shoulder. Thinking maybe he could help she explained the problem and as if the mysterious stranger had been waiting for just this moment, he took out a packet from his bag and told her to mix the contents with the flesh of a freshly killed crow that had been fried in ghee (clarified butter). She was also to rub the blood of the crow all over Ram's skin. Just then a plantation worker whom she had never seen before appeared with a dead crow which he gave over to the mother. The mother was overjoyed but when she tried to thank the two strangers they had disappeared. She carefully followed the instructions and within days the ailing child regained full health. However the skin of Ram which at birth had been a light tan, was turned permanently a dark bluish brown by the crow's blood. This same color is comparable to the color often ascribed to Krishna who is said to have been the color of a thunder cloud. In later years, if any devotee pressed Nityananda for details of his birth or childhood, he only said cryptically that a crow came and a crow left. As the young Ram grew into childhood, Mr Iyer, the lawyer for whom the mother worked grew very attached to him. The foster mother died when Ram was six, and Mr Iyer adopted him into the family. The devout Mr Iyer felt a spiritual attraction to Ram and took him on his pilgrimages to the Krishna temple. On these trips Ram would often explain abstruse metaphysical points to the amazed elder Iyer. A well known astrologer told him that, as shown in Mr. Iyer's chart, the boy was an incarnate personality and thus it was a great blessing for him to be in Ram's company. When Ram was ten years old, Mr Iyer took him to the holy city of Benares. There Ram asserted that he was leaving the household. Though Mr Iyer pleaded tearfully with him he would not change his mind. Before going though he conferred on Mr. Iyer a divine vision and promised they would meet again. Ram wandered widely around the North of India and the Himalayas for six years. Several sources indicate that he was known in the Himalayas as a great Kundalini Yogi. The Kundalini is the Serpent Power of the Mother aspect coiled up in the Muladhar chakra situated at the base of the spine in each person. In a spiritually advanced individual the awakened Kundalini energy rises up along the spinal column piercing the chakras and conferring new powers and states of consciousness as it rises until full Samadhi is attained on its reaching the highest chakra at the crown of the head. Meanwhile Mr. Iyer had returned sadly back to his home and resumed his life without the spiritual young Ram. As he grew older and approached the close of his life he thought constantly of the boy. At this time, quite unexpectedly, Ram turned up at his house, knowing Mr. Iyer's end was near and thus keeping a promise to see him once again. Mr. Iyer was ecstatic and kept repeating "Nityananda! Nityananda!" (endless bliss). After this incident Ram became known as Nityananda. The young Nityananda (then 16) took Mr Iyer to the city of Udipi for the darshan of Krishna and the Ananteshwar temple. Later Nityananda remarked that he had been present at the construction of the temple of Ananteshwar approximately 400 years earlier. Shortly afterwards, Mr Iyer became gravely ill. As he lay with his head on Nityananda's lap he expressed a desire to have a vision of the Sun God Bharga which he had worshiped his entire life. Bharga is the divinity whose outward expression is the sun of our solar system. Nityananda granted his request and Mr. Iyer merged into the ocean of spirit. "one must seek the shortest way and the fastest means to get back home - to turn the spark within into a blaze, to be merged in and to identify with that greater fire which ignited the spark" Nityananda. 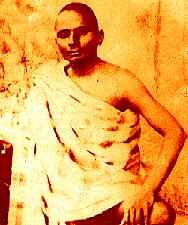 After this Nityananda wandered far and wide and is said to have been in Ceylon, Rangoon, Singapore, and Burma before returning to spend time in the south of India. During World War I he was forcibly drafted into the army. He later laughed as he told of being examined for his physical. The doctor could not hear any heartbeat nor find any pulse and so rejected the hearty Nityananda as unfit. During this time period he is known to have gone to Palani. After the morning worship, the priest of the Palani shrine was locking the doors and going down the steps when Nityananda accosted him and asked him to re-open the doors so that he could wave lights before the deity (Arathi ceremony). The priest was astonished that the young vagrant would ask a person of his stature to perform such a favor and refused the request. Nityananda proceeded as if he had not heard the refusal and somehow opened the locked doors and entered the temple. Shortly afterwards the priest heard the temple bell ringing and he looked up to see Nityananda in place of the deity with invisible hands waving arathi lights before him. Then Nityananda came down from the temple and stood on one leg looking upward in a yogic asan (posture). As he stood motionless a lot of money was poured at his feet and Nityananda gave it to the leader of the local sanyasis to establish a meal center for the visiting pilgrims. Later it came out that the local sanyasis had been praying to the Lord at Palani to be provided with at least a daily meal during their stay there. Again when he stayed at Mangalore, visiting devotees would often leave money at his feet. He would ask that the money be collected and after a few days when there was enough he would order a feast for the poor. He would allow only the finest quality foods to be purchased and would himself help in preparing and distributing the food. He would ladle out huge portions to each person even when it appeared that there was not enough food to go around, but many people who had been present at these feedings attested that the food never ran out before everyone had had enough. Later when he had established a permanent ashram at Ganeshpuri, he instituted a daily feeding of the poor children in the area which continues even today. In the early days of feeding the poor many people would help pay for the feedings although others around them thought they were being manipulated by the young Nityananda. One such was a youth from a well to do family who would occasionally bring sums of money and give them over to Nityananda. The father of the boy thought he was being influenced unduly by what he considered to be an eccentric drifter and hired assassins to have Nityananda removed from the scene. Nityananda was with some devotees one day when he suddenly got up and walked away from them with a smile on his face. They followed to see why he had left so unexpectedly and came upon him being held by one of the hired men while the other had a knife which he held above his head with his arm extended upward. The devotees grabbed the men and took the knife away from the one would be assassin. He was in great pain and shouting to have his arm restored to normal. It was frozen in the upright position and nobody could bring it back down to a normal position. Finally Nityananda touched the man's arm and it went back to normal. Afterwards the police had the would be assassins locked up but Nityananda wanted them to be freed. The police did not agree and so Nityananda determined to stay outside the jail until they agreed. After three days without food or water his devotees finally convinced the officials to let the men go free. The two later became devotees and the local officials gained a deeper appreciation of the young eccentric sadhu. Particularly holy people attract both good and evil and young Nityananda was once attacked by some young roughs who wrapped a kerosene soaked rag around his hand and set in on fire. Nityananda characteristically stood there stoically as his hand burned, outwardly unfazed, but he transferred the actual pain to the person who had lit the rag on fire. The perpetrator ran about screaming in pain and apologizing for his behavior. Nityananda extinguished the fire and simultaneously the pain felt by the young man. At this period of his life, Nityananda was in his early twenties. He traveled in south western India around the cities of Mangalore and Kanhangad and lived quite simply. He had no possessions or home and wore either a simple loin cloth or nothing at all. He was often seen standing stiffly at the top of a tall tree for hours at a time. He would throw leaves down to the people that gathered below. His healing powers were widely known and these leaves were gathered eagerly and treasured for their medicinal properties. After one such incident, all the leaves had been gathered by the crowd who then had gone away to their homes. Only a blind man remained who had not gotten any of the coveted leaves. He pleaded with the young Nityananda to restore his sight as he could no longer hold a job and was therefore now a burden to his family. Nityananda descended from the tree and took a hand full of leaves and rubbed the man's eyes with them but said nothing. There was no change to his eyesight so the man went back to his home. But on arising the next day, his eyesight had been restored. On another occasion a man wanted some leaves for his mother who was seriously ill with a lump in her leg. Medicines had been tried but to no avail. Nityananda responded, "This one knows and is there" but did not offer any leaves. The man did not understand and returned and brought his mother to the tree where Nityananda was but the young master was no longer there so he left. When he returned home with his mother he was surprised to see Nityananda descending the stairs of his home from the attic. Nityananda rubbed the affected area for a few minutes and the mother soon recovered. After many such incidents the reputation of the strange young ascetic as a healer spread far and wide. A peculiar characteristic of the young Nityananda was that he would not take food or water for himself. Occasionally a devotee would give him something to eat or some water to drink and he would signal when he had enough. If no one offered anything he would go days without food or water. He also seemed to be oblivious to heat or cold and he often stayed on the hot sands of the Ganga under the hot Indian sun for days at a time. Some days he would spend the entire day just sitting there looking directly into the sun. Some people tried to approach to visit him but they could not cross the burning sands until evening. In 1918 he was in the city of Udipi at the Krishna temple there. Two of the local men, Dr Kombarbail and his friend Mr. Bhat used to daily walk to the temple and one day were attracted by the lean, bright looking Nityananda standing among the usual collection of ascetics at the temple. They tried to talk to him but he turned away from them declining to be recognized. A few weeks later they saw him again alone at the Ananteshwar temple. The doctor seized his hands so he could not retreat and addressed him rapidly in three different languages (Hindi, Kanarese, and English), not knowing which Indian dialect he might speak. The young ascetic appeared to be having trouble speaking and repeated several times "Nityananda, Nityananda" alluding to the fact that his blissful state made the formulation of speech difficult. When he finally responded to the two gentlemen, the unschooled Nityananda replied to them fluently also in three different languages - two of which they had used in questioning him (English and Hindi), and a third, Konkani, which was their own native language which they had given no indication of knowing. During this period of his life, Nityananda traveled to many different villages and cities in the area. His presence was unpredictable and he had an uncanny knack of turning up unexpectedly somewhere whenever people in the area would gather and express the desire to see him. Often he would disappear in one place and appear up to fifty miles away and nobody could explain how he had covered the distance so quickly. Once he was invited to Mrs. Krishnabai's house who had lovingly prepared the place for his visit. He arrived but left immediately saying he could not stay. There was a large crowd watching as Mrs Krishnabai's husband and a friend tried to restrain the young master and bring him back, but the tall thin Nityananda casually picked them both up and continued walking. Finally after about half a mile he turned back to the house saying "She stopped me"; meaning that the magnetic pull of her love and devotion had made him return while the men's physical efforts to stop him had been fruitless. At the Krishna temple some of the local delinquents took a disliking to him and would throw rocks at Nityananda to keep him away. Whenever a rock would hit him, it would scintillate but then fall to the ground again as an ordinary rock. After one such incident, a large number of these stones were later inexplicably found at the feet of the Krishna statue. Recognizing the true status of Nityananda, the elderly Swami of the local monastery let it be known that Nityananda was no ordinary sadhu and was to be treated with the respect he was due. One day Nityananda picked up a cocoanut and offered it to Mrs. Sitabai, a young married woman. Normally it is very auspicious to receive a cocoanut from a holy person and a married woman would receive it gratefully as a benediction warding off widowhood. However this woman was filled with doubts because she was from a high-caste family and she didn't know if it was proper for her to receive a gift from the casteless Nityananda. Nityananda held it for several minutes waiting for her to accept it. She refused. Three months later she was a widow. "There are various tests to which a devotee is subjected: they could be of the mind, or the intellect, of the body, and so on. A number of such tests are there. In fact, God is conducting tests all the time; every occurrence in life is a test. Every thought that crops up in the mind is in itself a test to see what one's reaction will be. Hence one must be always alert and aloof, conducting oneself with a spirit of detachment, viewing everything as an opportunity afforded to gain experience, to improve oneself and go on to a higher stage." Nityananda. Nityananda was fond of riding the trains. Since many of the railroad personnel knew him, they would often let him ride in the engine car or in the train, even without a ticket. Once a new official had him forcibly removed from the train because he was without a ticket. Nityananda remained passive even though he had been handled roughly, but when it was time for the train to depart, the train simply would not move. Some of the passengers approached the official, explained that Nityananda, who was not an ordinary sanyasi, should not have been handled so roughly. They then escorted Nityananda back onto the train and the train was able to start as soon as he boarded. In 1925, Nityananda settled briefly in the Kanhangad area and began construction of the Sunrise - Sunset caves. This project entailed building a road up to the area and clearing the surrounding jungle. The sudden activity in the area was noticed and some of the local officials asked him with what authority he was taking these actions. He told them that someday there would be government offices at the site and that he was clearing the area for them. This answer seemed to satisfy them and they left him alone. Subsequently, in later years this came true. After the preliminary clearing and road work was over, Nityananda began carving the caves from the rock hills of the area. Forty caves in all were dug with six entrances, three facing East and three facing West so that there was always light within the caves no matter what time of day it was. Many of the locals were hired to assist with the digging of the caves and the manner in which they were paid was most unusual. Nityananda would sometimes direct the foreman to a certain tree where he would find just the right amount of money lying on the ground at the foot of the tree. 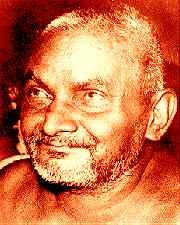 At other times the workers would line up and walk past Nityananda and as each man went by, Nityananda would open and close his empty fist and down would drop the exact daily wages for each man. One of the devotees tells of an interesting incident that happened during that time. A man came to Nityananda and demanded that if he be such a great holy man, let God be revealed to him. At first Nityananda simply ignored the man but this only made him more demanding. Eventually Nityananda grabbed an umbrella and aimed it at the man's toe. Nobody exactly knows what the man experienced but he screamed and lost consciousness and was taken away to a hospital. The doctor in charge of the hospital came to interview Nityananda and went away to inform the police that he appeared insane and possibly dangerous. The police came and took him off to the local magistrate. Nityananda declared that he had done nothing and the magistrate asked if he had any witnesses. The Master pointed to the four pillars of the hall and said that they were his witnesses. The magistrate concluded that Nityananda really was out of his mind and had him locked up. After a while Nityananda told one of the jailers that he had to urinate. He was given a container to use, but it soon filled up and started overflowing. They brought him another and it too was quickly filled. Next they brought a large water pot and he soon filled that as well. The police concluded that he was indeed as reported by the devotees an extraordinary individual and should not be locked up. The authorities soon released him and he returned back to the construction site in time to disperse the afternoon wages. After the caves were completed around 1933, Nityananda spent several years traveling about once again. Once three Muslims came to him and stood reverentially before him. They had just returned from a pilgrimage to Mecca and they told him so. He asked them what they saw there and they replied, "We saw you there, Swamiji, and hence we are here to pay our homage". Nityananda averted his face but not before a smile was seen on his lips. In his travels he carried out a number of construction tasks. He repaired the hot spring tanks at Akroli and also built a charity hospital opposite the Vajreshwari temple. He repaired the Nath Mandir near the temple, and also supervised construction of a large well which is the main source of water for the temple. At about that time it is reported that an earnest seeker came to him and asked to have his Kundalini energy awakened. Nityananda touched his spinal chord and the man went into the samadhi state. By this time, Nityananda had a very large following of devotees and people who's lives he had touched in some way. In 1936 he moved to the Ganeshpuri area outside Bombay. He stayed near the Bhimeshwar temple and for the most part his travels were behind him. At that time the city of Ganeshpuri was surrounded by jungles and thickly wooded areas filled with wild animals including dangerous ones such as tigers and cobras. At the temple there was a massive old pipal tree in which many snakes lived. In some mysterious manner, Nityananda ordered the snakes to leave the area, which they did. He then performed a ritual at the site of the sacred pipal tree and had it cut down. As word spread of his presence in the area, many devotees gathered there and began to construct a shelter. Nityananda began clearing the jungle around the area and constructing a road up to the ashram. There were many hot springs in the area and these were fashioned into suitable pools used for ritual bathing. Many of the local poor stopped by daily and Nityananda would share food with them. 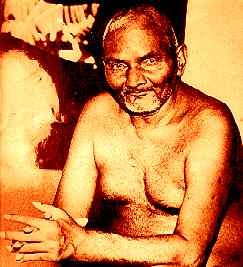 This was the beginning of an Ashram and Nityananda was to remain there until leaving the body in 1961. As time went on, many facilities for lodging were built by devotees and simple furnishings were provided for comfort and preparation of food. It should be noted that the Master never was known to consider anything as "his". He would say "There are so many things in this Ashram. If this one goes elsewhere, none of these things would be taken". Being established in the Atmic consciousness he never referred to himself as "I" but would say "this one" or "from here". As the years passed the number of visitors to the Ashram increased. Swami Chetanananda, tells of going on a visit to the Ganeshpuri Ashram in a taxi in 1973, 12 years after the Master's passing. The taxi driver who was taking him told of going to the same ashram as a young man. He had heard of a great saint living at Ganeshpuri and had gone there to get his blessings. He arrived to find a very long line of people waiting to file past Nityananda for his darshan. As he got closer he observed that as each person's turn came they would say something to Nityananda or offer a gift and he would respond very simply with a nod, a gesture, or just a sound. Therefore he was very surprised when his turn came and Nityananda said to him, "Go and bring your brother here." His brother had been blind since birth and the next week, he returned to the Ashram and was told by Nityananda to leave the brother and come back for him in three days. When he returned, his brother could see. Once a family came to the Ashram bringing their severely sick infant. The child had been sick with pneumonia for three days and had not opened it's eyes during that time. The family held the baby up to Nityananda and asked that the child's eyes be opened. He passed his hand in front of the baby's face and the eyes opened but as he brought his hand down again the eyes closed once more. He told them to perform the last rites as the child had died. Later a close devotee ventured to remark that it was unfortunate that the child died at the ashram. If it had to die, it would have been better if had happened elsewhere. Nityananda rebuked him saying "What do you know or understand about these matters? This is the fourth time the same child has come out of the same mother's womb and it has been seeking mukti (liberation). It has been wanting freedom but karmic law has been dragging it down again and again for manifestation in the same family. Its intense desire has been fulfilled now and it won't have to come again." The devotee later talked with the family and learned that there had indeed been three previous children that had all died shortly after birth. Around 1942 a businessman came to the Ashram. He at one time had a profitable business but had since lost everything. He came to the Ashram seeking Nityananda's blessing. On the day of his visit, the Master kept repeating the word raddi (waste material) over and over. The word planted itself in the man's mind and he kept thinking of the word that day and the day after even though he had left the Ashram. The next day he was walking through the city and he came across an auction in progress. A quantity of raddi was being auctioned and he purchased it immediately and was able to resell it at a profit. He continued buying and selling the manure and soon was making back some of the money he had lost earlier. He became a regular devotee and was thereafter known as Radiwalla (he who is in charge of manure). Another visitor was a man who had consulted a well known astrologer to examine his wife's horoscope. The astrologer did so and informed the man that his wife would soon die due to a bad affliction of the planet Saturn. The man was greatly upset as he had also two young children who would have been left motherless. He went to see Nityananda and seek his aid in the matter. He arrived at the Ashram at a time when there were only a few people present. He quietly sat down and Nityananda immediately said to him, "Saturn is there, but God is also there." He then gave the man a series of complicated instructions to carry out. The man carefully followed out the instructions to the letter and when the day came for the predicted event, it came and went without incident. At the nearby Krishna temple there was a box in which donations were collected. One night Nityananda asked his devotees to go and check to see how much money there was in the collection box. He was told it was nearly full, and he told them to empty it but to leave one-fourth of the money in it. The next morning the devotees found that the box had been broken into and all the money was gone. They ran to tell Nityananda but of course he already knew of it. That is why he had asked that most of the money be removed. He explained that among the visitors the previous day was a very poor man who had sat there and prayed silently to be allowed to break into the collection box as he was near starvation. The master had approved but said the amount left for him was adequate to meet his current needs. One night at the Ashram, a group of visiting devotees was staying in a room and Nityananda came and sat with them. He remained silent most of the time. One of the ladies spoke to another of his silence and the second woman replied that it was sunset, a good time to meditate, thus implying that the Master was probably deep in meditation. Nityananda heard the conversation that was going on in his presence and said to them, "All that was over in the mother's womb". Once one is established in infinite consciousness, one becomes silent, and though knowing everything, goes about as if he does not know anything. Though he might be doing a lot of things in several places, to all outward appearance, he will remain as if he does nothing. see places from here or deal with people there." The Master made a similar statement towards the end of his life. It appears that there were many signs of his impending passing but his devotees were mostly unaware of them. One woman devotee properly interpreted some of the signs and was distraught to learn of his plans to depart. He said to her, "Why are you crying? Don't cry. More is possible on the subtle than on the gross." Although the number of people coming to the Ashram increased greatly towards the end of his life, many of them came merely to secure material benefit, such as a better house, more money, a car, etc. Often these wishes were granted through his blessings but instead of being satisfied, the people would just return to ask for more. Nityananda appeared to have been sad that so few were interested in what he had truly come to give them - spiritual enlightenment. "It is possible only if a few devotees come forward and make a request; not any devotees but those imbued with desireless devotion, bhava (feeling) and prema (love).... Even one such is enough and the samadhi will be canceled. When such a devotee is present, even God cannot take leave without his permission, or be able to disengage himself from the bond of his pure love." However though there were dozens of close devotees and hundreds and even thousands who came to him, there were none advanced enough to be able to say they were completely without desire. The next day towards noon he took a few deep breaths and then one very deep breath so that his chest was fully expanded. He straightened his legs, put his hands over the abdomen, and then was not seen to move anymore. Though he had shed the body and the point of contact on the physical plane was no more, his devotees continue to have experiences that he is still looking out for them. Even on the day of his Mahasamadhi, his devotee, Dr. Pandlaskar, received his grace in a strange form. The Doctor's young son (then nine years old) arose earlier than usual and in a very uncharacteristic manner said to the mother and father, "What are you doing here? Go to Ganeshpuri. He will be going today. There is a call for him from the assembly of sages for help he alone can render in connection with the forthcoming ashtagraha conjunction (in February 1962, eight planets lined up in the sign of Capricorn) which portends great evil to the world in general and to India in particular." The son knew nothing about astrology and certainly had no way of knowing about the passing of the Master on that day. During his life Nityananda never held forth views or any dogma to be followed. He never required any certain beliefs or practices of his devotees. He preferred that they not even discuss their own paths or experiences with one another. "People come here with different predilections", he once explained. Once some devotees of Shirdi Sai Baba came for his darshan. Before they could all enter he shouted to them, "Go to Shirdi. Is the Old Man sitting there different than here?". "It (the state of mind) should be like a lotus leaf, which though in water, with its stem in the mud and flower above, is yet untouched by both. Similarly, the mind should be kept untainted by the mud of desires and the water of distractions, even though engaged in worldly activities." During his life he always set an example by rendering service to others through his feeding of the poor and other activities. His devotees knew that he placed a high value on serving others. Once one of them asked him what would be the result of performing seva (service) for Satpurushes such as himself. In an angry tone Nityananda said to him, "Who wants seva? Does the God asked to be worshipped? It is the man who does so, to get something out of him. Go back and do your duty without desire for fruit (ie reward for your actions) and without sacrificing efficiency. That is the highest seva that you can render. As for spiritual progress, the essential thing is vairagya (detachment from worldliness). Without that there can be no progress." "The Ocean has plenty of water. It is the size of the container brought to collect it that determines the quantity taken"
see the Millenia Press Website. This webpage also features pictures and sayings of Nityananda, pictures of the Ganeshpuri shrine and information about his photographer.